EK Water Blocks releases the EK-FC1080 GTX Ti FTW3 water block for the EVGA GeForce GTX 1080 Ti FTW3 based graphics cards. The water block offers superior cooling versus the stock air cooling solution. The efficient cooling offers users better overclocking headroom to reach higher overclocks with cooler temperatures for high-performance gaming or for running GPU-intensive applications. The water block is a full-cover block that offers direct cooling to the GPU, VRM and memory chips as the coolant passes directly over the critical areas of the graphics card. This provides superior cooling thus offering better stability on overclocked settings. The water block also features a central inlet with split-flow cooling engine design which offers the same efficient cooling performance regardless of flow direction. The water block also offers good hydraulic performance that also works efficiently with liquid cooling systems with weaker pumps. 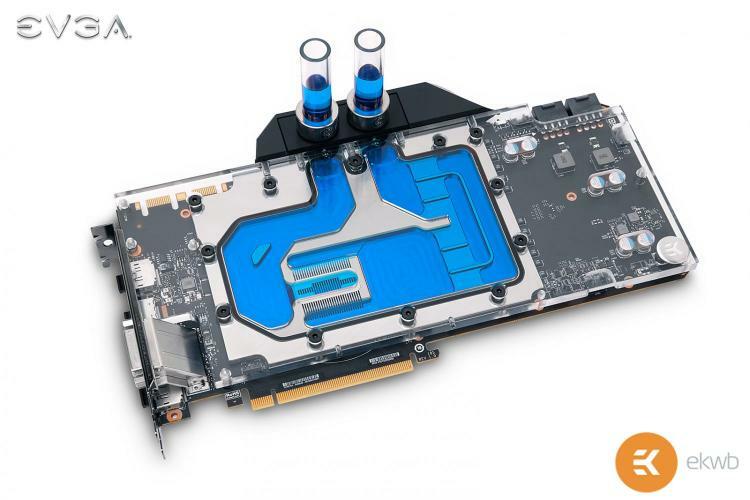 There are two models of the EK-FC1080 GTX Ti FTW3 water block – a Nickel variant and an Acetal+Nickel variant. Both variant’s acrylic plexi top has two pre-drilled slots for 3mm LED modules for lighting. There’s no performance difference between the two variants. The water block also features the aesthetic terminal block EKWB recently released for high-end graphics card water blocks. The water block is now available for pre-order at the EK webshop and partner resellers with an MSRP of 122.95€/ $ 139.99 for both the Nickel and Acetal+Nickel variants.